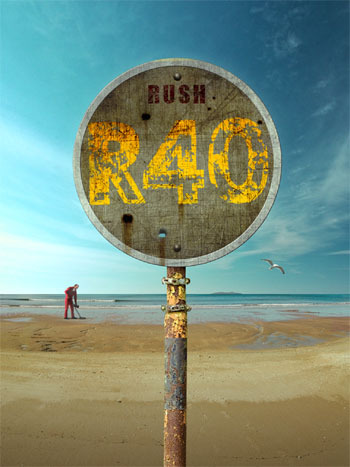 Rush's R40 40th Anniversary Collectors Box Set was released November 11th, and is available on both DVD and Blu-Ray. The collection opened up at #2 on Billboard's music video sales chart. Click here for the linernotes, including a new essay written for this collection by music journalist Martin Popoff. 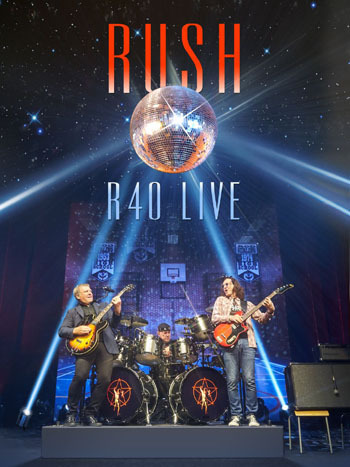 R40 contains Rush's five most recent live videos (Rush in Rio, R30, Snakes & Arrows Live, Time Machine, Clockwork Angels Tour), as well as an R40 bonus disc containing oft-requested items from the vault as well as a 56 page hardback book. The gem of this collection is the bonus disc, containing the complete Laura Secord Secondary School 1974 footage of which only three tracks have been previously available. Other rarities include Lock And Key 88 (an outtake previously only available on select versions of the A Show of Hands laserdisk), the Passaic NJ Capitol Theatre show from 1976 (previously seen in Beyond The Lighted Stage), and Rush at the Molson Amphitheatre in 1997 (a portion of the previously shelved Different Stages video), as well as the I Still Love You Man video from the Time Machine Tour and footage of the the Rock & Roll Hall Of Fame Induction in 2013. For additional details view the official press release. 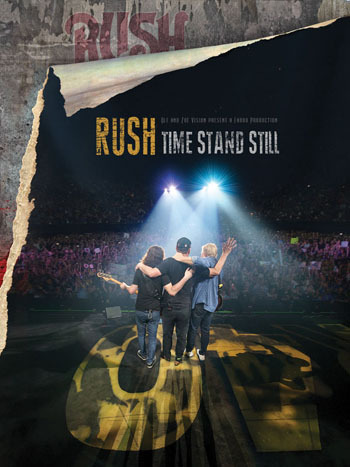 There is a special edition of R40 available at both RushBackstageClub.com and BestBuy.com, which includes an 'R40 Completest' DVD which contains additional content from the original R30 release, that is not included in the standard R40 release. The DVD edition 'R40 Completest' DVD contains: a) the eight songs not included on the original R30 DVD release; b) the Anthem "Church" video; and c) three songs from Molson Amphitheatre, June 30, 1996 which are in addition to those found on the standard R40 "Bonus Disc". The Blu-Ray edition 'R40 Completest' DVD also contains the Anthem "Church" video and the three added tracks from Molson '96, but instead of the eight R30 tracks (which are already on the R30 Blu-Ray), it contains the bonus features found on the original R30 "Deluxe Edition" DVD which, while they are already included in the DVD edition, were not included on the Blu-Ray release in 2009 (and hence are not included in standard R40 Blu-Ray edition either). As announced in the October issue of PLSN news, Howard Ungerleider received the Parnelli Visionary Award at the 14th annual Parnelli Awards ceremony, held last night (Nov. 22) in Las Vegas. "While perhaps best known as the visual designer behind four decades of Rush concerts, he’s also worked with the likes of Blue Öyster Cult, Van Halen, Queensrÿche, Tesla, Rod Stewart, Supertramp, Def Leppard and Alicia Keys, among others. His work on the corporate side has been just as innovative, creating custom environments for companies ranging from General Motors and Mercedes-Benz to the Buffalo Sabres hockey team." PLSN has also shared a 14 minute video interview with Geddy and Alex regarding Howard's work which you can view here. You might recall a couple of years ago when Neil Peart, Primus' Les Claypool, Tool's Danny Carey, and Stuart Copeland jammed at Copeland's house and recorded the track Count Drumula. A video of the session can be seen here. "Well, I had one tragedy. I had the Rush guys, Neil Peart and Alex Lifeson, over here, and we jammed through the night. We banged every drum, Neil and I had the drum battle from hell, Alex played every guitar, cello, horn, it was just music all night. And then I started cutting it and putting it together, and Les Claypool came over and he sang [Rush's 1975 epic] “By-Tor and the Snow Dog” or something like that over the sessions. And so I’m editing it together, and I pull out my fancy-schmancy film-scoring tools, my orchestral samples, and built this huge track. And then my hard drive crashed! And I sent it to two or three different “drive doctors,” who all charged a fortune, and none of them could rescue the disc. And I hadn’t even done a rough mix. I was a little crushed by all that. That kind of popped the balloon on the whole thing." "From singing the praises of new Cubs manager Joe Maddon ("He's brilliant") to fending off fantasy baseball questions ("Too early. Way too early,") he gave us his quick takes on the Major League Baseball season that was, and, of course, what he expects from his beloved Toronto Blue Jays in 2015." Two of Alex Lifeson's paintings which were auctioned off for the Kidney Foundation of Canada are now available as a limited edition print individually numbered and signed by Alex. 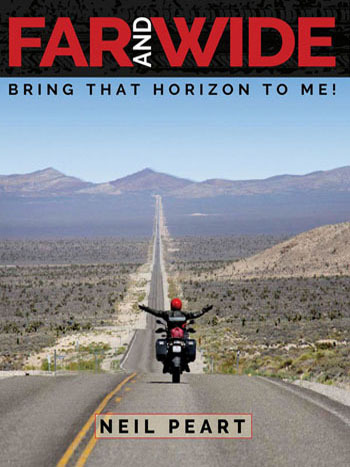 What a great Christmas gift for Rush fans which also will raise money for a great cause! "The Kidney Foundation of Canada - Atlantic Branch and Alex have teamed up to produce these two limited edition set of prints. Only 300 prints have been made of Self Portrait #1 and only 200 prints have been made of Greek Salad. Each print is numbered and Alex Lifeson has personally signed each individual print. That's right, each print has Alex Lifeson's ORIGINAL signature on it. The print is on high quality, heavy stock. In addition, each print comes with a Certificate of Authenticity, signed by the Executive Director of the Atlantic Canada Branch of The Kidney Foundation of Canada, confirming that the print that you have purchased is one of only 300. The certificate also shows the print number (eg. Print No. 33 Limited Edition of 300). The certificate is printed on linen paper, making it ideal for framing with the art print or for displaying on its own." Click here for more information and to purchase! - Thanks Trina for the headsup! Trying to get some Rush coolness to rub off on them, during Nickelback's performance last night on Jimmy Kimmel Live, drummer Daniel Adair was spotted wearing a bootleg Rush tshirt. - Thanks to Tod O'Donnell for the headsup! Last Thursday Cracked.com posted the hilarious "4 Seemingly Normal Things That Are Inexplicably Hard to Find", essentially a spoof of Where's Waldo? but with amusing cultural references. The feature promotes the release of Finding Jesus by Winston Rowantree, a collection of such illustrations published last month. 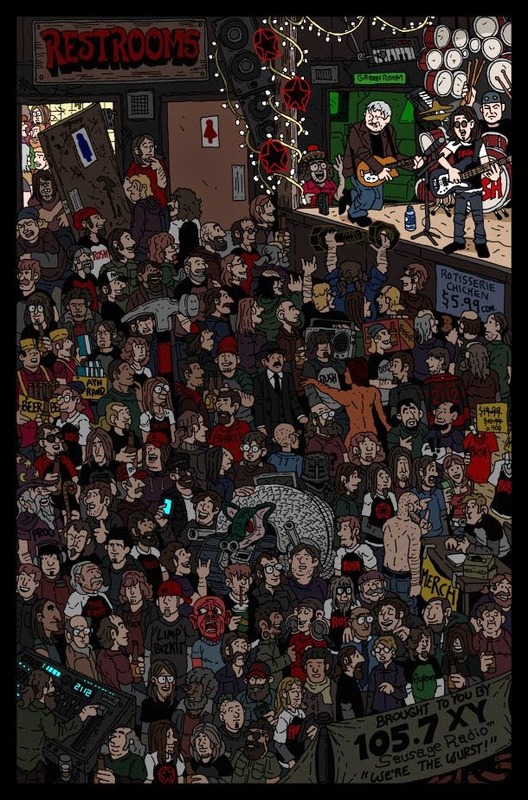 One of the examples posted is "A Woman at a Prog Rock Show", and the illustration features a Rush show, complete with dozens of Rush references. - Thanks to Joe Pesch for the headsup! Radio.com has just posted a new Q&A with Geddy Lee and Alex Lifeson where they talk about the new R40 collection, specifically the Rock and Roll Hall of Fame Induction Ceremony bonus feature and Alex's acceptance speech. Other topics include cameo roles the duo have taken in the last few years, the concert videos, and Alex also squashes old rumors that Sarah McLachlan contributed to a shelved followup solo album to Victor. Alex also states that when they go out on tour next, "ideally, we’d go out with a couple of new songs, and revisit some old stuff, maybe stuff we haven’t previously played," and regarding playing deeper cuts live, goes on to add "I think there are songs that are real fan favorites that we’ve avoided for a long time. And I think if we plan to go back out, we would have a very close review of some of those songs." Check out the full interview here. - Thanks to Ed at RushIsABand for the headsup! Geddy Lee on Q103's "Out Of The Box"
Last night, Geddy Lee appeared on New York's Q104.3's "Out of the Box" with Jonathan 'JC' Clarke to talk about the R40 Collector's Boxed Set. The eight minute interview is available for your viewing pleasure here. Today RollingStone.com posted "Rush's Geddy Lee Answers Your Twitter Questions" with the tagline "the singer reveals Neil Peart's post-show smell, his reaction to the band's Rock Hall induction and if he'll attend your yoga class". Check it out here. 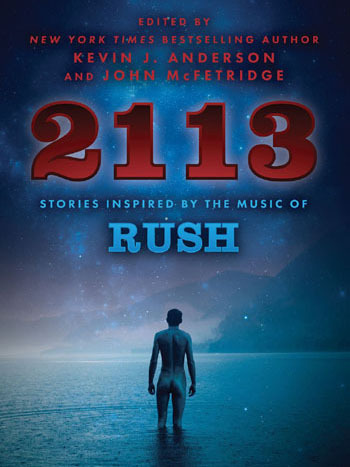 To commemorate the release of Rush's R40 Video Collection, CBC Canada has offered up a host of special features, including a new retrospective piece written by Dave Bidini. Today Lorne Wheaton appeared on Toronto's Q107 with Kim Mitchell. Check out the full interview here. 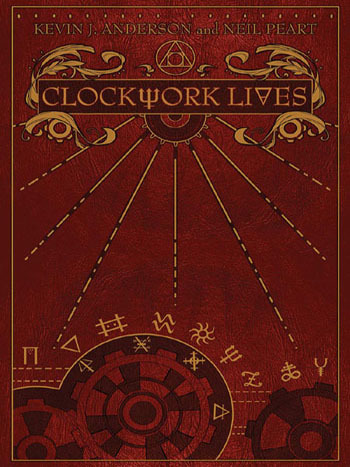 The final chapter of the six part Clockwork Angels comic book series was released yesterday, November 12th. The standard comic store cover series can still be ordered directly from Boom! 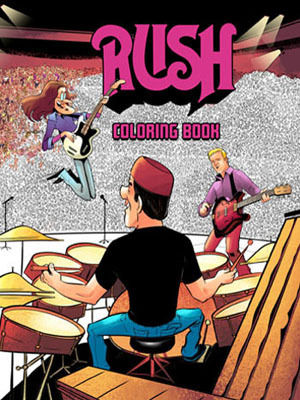 Studios at this link, and the limited edition cover featuring key lyrics from Rush songs that are tied to the comic is also available via BOOM! Studios as well as the Rush Backstage Club. "Once, he was just a boy tending to the apple orchards. Now, Owen Hardy is flying a magnificent airship across the skies of Albion! In the course of this adventure he learns a secret about his own family, one that will take him to the hallowed Seven Cities!" Last night Geddy Lee was one of the guest performers at The Who's concert for Teenage Cancer Trust at London's Shepherd's Bush Empire. Today's review in London's Guardian newspaper noted "Rush’s Geddy Lee’s leather-lunged take on The Seeker confirms that when the Who rock, they really rock," and Rollingstone reported "Geddy Lee put in a laidback performance on 'The Seeker.' The Rush singer, who had flown in from Canada especially for the gig and celebrates his own band's 40th anniversary this year, also played bass and later said he was 'thrilled to support the Teenage Cancer Trust while celebrating the music of the Who, a band that changed my life.'" Geddy Lee's performance of "The Seeker", which was covered by Rush performed on Feedback, can be seen in these fan filmed video recordings here, here, here and here (embedded below) . An extensive gallery of photos from the event is available here. "Pearl Jam’s Eddie Vedder, Liam Gallagher, Ricky Wilson from the Kaiser Chiefs, Manic Street Preachers’ James Dean Bradfield, Geddy Lee from Rush, The Strypes, Brody Dalle, Tom Odell, Amy Macdonald, Andy Burrows and Rizzle Kicks as well more to be announced soon, have chosen their favourite WHO songs to perform in aid of Teenage Cancer Trust." In a new interview posted today at MemphisFlyer.com, 3 Doors Down guitarist Chris Henderson talks about how Rush's Chronicles compilation helped him through a bad breakup, and how working with Alex Lifeson (in spring 2000, shortly after the release of Better Life, Lifeson produced three 3 Doors Down tracks: "Wasted Me", "Dangerous Game" and "Dead Love") taught him to be a better producer. I had a girlfriend. I was engaged to her. We broke up after five years of being together. She went off and did whatever to get over it. 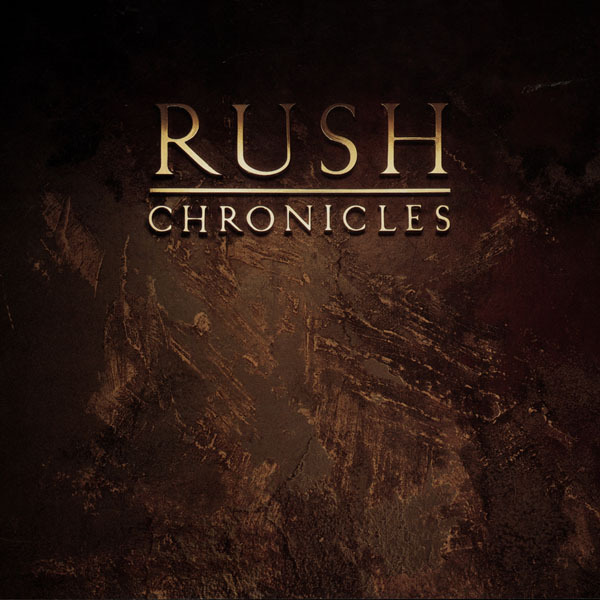 I put in Rush Chronicles, got in my truck and drove around for five days. That's how I got over that relationship. After I listened to that record, I said, 'I don't need this crap. I've got Rush.' So needless to say, when Alex Lifeson's name came up as a producer, I was in, Jack. I didn't need to hear anybody else's name. I can't explain how nice a guy and how smart he was. How cultured he was and how great a musician he is. I can't put into words how much his influence brought to my life before I met him and after I met him. There's not a week that goes by that I don't think of that experience. I spent three weeks with him in the studio. He taught me that the technical aspect of being a producer is not the most important part. Tee most important part is the song and how to delegate. If you want to change someone's art, they are going to fight you on it. If it's all about the art becoming better, you've got to get your point across. That's what Alex taught me. Instead of saying 'I'm a producer. I'm from Rush. You need to listen to me.' He wasn't like that. He came in and was like,' Think about it like this: What does the fan think? From a radio listener's perspective, you have about 13 seconds. They hit that seek button. That's the way it works. He taught us that. Rollingstone.com has posted a new interview with Geddy Lee where he confirms that plans for a 2015 tour are still up in the air. "We're still talking. Everybody has a different idea how they want to spend the next couple of years, so we haven't come to a decision. I'm ready and happy to play if everyone else agrees. I think in the next couple of months we'll decide to do something or not." "The office and our manager is always pushing us to release some archival stuff. Seeing as we were off, we said, 'Have at it.' It was interesting seeing all the old footage. We recorded a show on the Test For Echo tour we'd forgotten about because it came just before a particularly dark period in our history. It was painful to think about, but when we listened back we realized we were in good form that night. It would have been a shame to not unearth at least part of it." Click here for the complete interview. - Thanks to Skip Daly for the headsup! 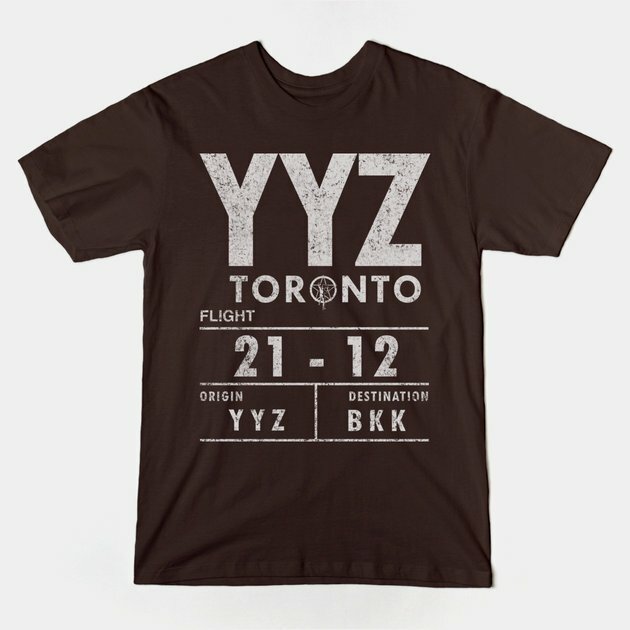 UPDATE: Nov 10: Neil Peart appeared on The Strombo Show this past Sunday, November 9 on CBC Radio 2 in Canada from 8-11pm. 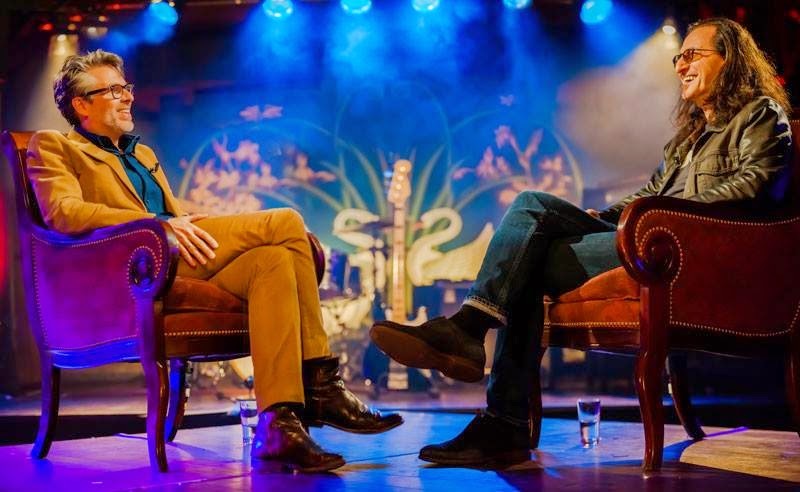 Neil's complete 28 minute interview is now available here. In addition, the complete broadcast is available as a podcast on Strombo's SoundCloud channel here (Neil's interview is from 55:00 to 2:10:22). "In the interest of encouraging the band to pull some choice rarities out of the vault, the song list (below) is limited to songs from the Peart recording era that Rush has never performed live ("Feedback" covers excluded). As in the past, each person gets to select FIVE songs from the list below and submit their votes, with each individual being allowed to cast one "ballot". No guarantees, of course, but with any luck the band will keep an eye on the results and take the results into some degree of consideration. (We'll certainly be letting Anthem/SRO know the site is up and running again)." RUSHfest Scotland, the Scotland convention for Rush fans, is hosting a world wide raffle to win a 12 year old bottle of The Macallan whisky signed by Neil Peart, in an effort to raise funds for Macmillan Cancer Support. It is a well known fact amongst RUSH fans that Neil Peart’s favorite tipple after a show or a bike ride is a ‘wee measure’ of 'The Macallan', one of the most highly regarded distillers in Scotland. The 12 year old Macallan, which will come with a certificate of authenticity, is no longer in production and sure to go up in value within the whisky collector community. Each drawing entry is just £5 GBP (~$8 USD), and it is open worldwide. The more you donate, the more times you get entered into the raffle - each multiple of £5 GBP is another entry in the raffle. The drawing will be made on April 18th, 2015. For complete details, visit https://www.justgiving.com/rushfest-Scotland/. - Thanks to Mike Sword for the headsup! Yesterday Rush.com announced that Alex Lifeson will be attending the TJ Martell World Tour of Wine Dinner & Auction, honoring RUSH & Doug Shafer, President of Shafer Wines. The event will take place Thursday, November 20th at Capitale, 130 Bowery, New York, NY, beginning at 6:30PM. Tickets are available here. Each year, our World Tour of Wine guests join us for full tastings from the cellars of some the most avid wine lovers and collectors in the United States who donate their wine for those at their table to drink. The 220+ guests in attendance also enjoy an exquisite five-course gourmet meal (featuring courses prepared by a celebrity chef) at this dinner while bidding on silent auction lots from the wine, sports and music/entertainment fields, as well as 8-10 live auction lots. What makes the World Tour of Wine truly unique is the fact that, unlike most charity dinners where the wines are provided by either one or a select few vineyards, each table is pouring wine from the collections of its “wine host”. Therefore, no two tables are alike in terms of what is being poured, and “table hopping” between guests begins almost as soon as the corks are pulled! UPDATE: The taped show will air next April 2015. 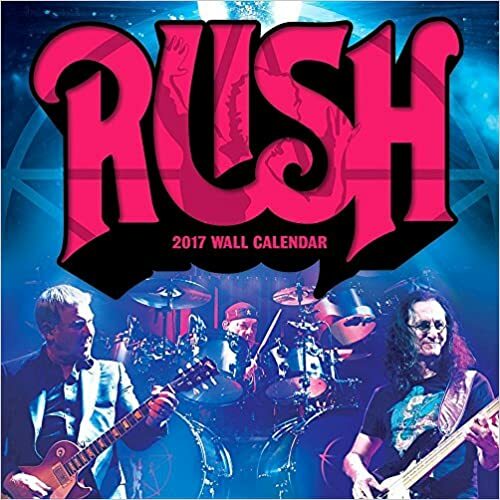 Yesterday the day after the taping, Rush.com shared "75 minutes flew by talking to one of my favourite writers and a truly awesome person" - Geddy Lee (with Michael Chabon taping PBS Speakeasy airing in huge new year)"
Neil Peart appears in cow form in the 2015 edition of Chick-Fil-A's "Cow Calendar". 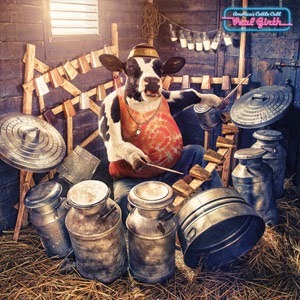 The photo for May is "Veal Girth", a drumming cow wearing a Kofia hat surrounded by an extensive drumset made up of milk cans, wash tubs, trash can lids and, of course, cow bells. You can check out the full calendar at chick-fil-a.com. - Thanks to Kevin Cooney for the headsup! 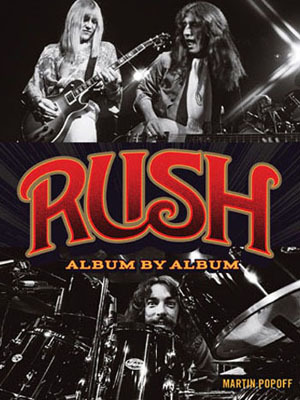 Premiere of Rush with John Rutsey performing "The Loser"
Rush's R40 40th Anniversary Collectors Box Set is going to be released next Tuesday on DVD and Blu-Ray, and today Radio.com has posted another premiere of one of the rarities from the R40 "Bonus Disc", titled "The Loser". This is Rush with John Rutsey at their finest! Also included is a new interview with Geddy wherer he discusses the song, which you can read after the Youtube link below. What went through your mind when you watched the footage of you guys performing in 1974? Well, watching that is like an out-of-body experience for me. Because I remember it, and at the same time, it was so long ago, it’s hard to know if it’s a real memory, or a dream state memory. It’s hard to feel like that same guy who was screeching on the stage back then in unusual clothing. Alex Lifeson told us that the thing that stuck out in his mind is that the audience were seated the entire time, no one got up! Was it bittersweet, watching the footage with John Rutsey? Yeah, it is sad in one sense, but it’s also quite a nice thing that this footage is available, so people can see what we were like with him, and what he was like. I think in a way, it helps keep his memory alive. He’s part of our history. Back then, John was the guy in the band who talked to the audience from the stage. Did you prefer that you didn’t have to take on that role? I was always the reluctant… everything. I was originally a guitarist, and the bass player in my old garage band quit, and they voted and I became the bass player. I was the only one that could sing, so I became the singer. I didn’t really want to write lyrics, so in the early days of Rush, John wrote the lyrics. I was a very shy kid, I didn’t really feel comfortable talking to the audience, so John did that. So I really kind of backed into my entire career. It’s worked out really well! I’m still playing it by ear. How long did it take for you to get comfortable with being the guy who had to do the onstage banter? It took quite a long time, really. I didn’t really have a persona. All the singers from rock bands in those days were taking on a persona of a very loud, sort of gregarious guy who would rile up the crowd. That’s not me, I’m not that guy. I’m not that guy socially, I’m not that guy period. For me to suddenly have to talk to the audience… I was rather soft-spoken, so it was always work for me to psych for myself up to try to do that. In the early years, the lack of persona seemed to be a problem. As we hung around, I think my lack of onstage persona has actually become my onstage persona. So you kind of grow into who you actually are. It’s kind of worked out for me. The ideal person to be our MC would be Alex, he’s naturally hilarious, he’s such a goof and such a funny, warm guy. But he’s, at times, even more shy than me. He didn’t want to do it either! I honestly don’t remember that song, and I didn’t remember it until I actually saw the footage of us playing it. And I didn’t remember it was called ‘The Loser.” So much for my memory! We wrote so many songs in the early days, and half of them fell by the wayside. A while back, Alex uncovered a demo tape that he and I had done for copyright purposes. Since we couldn’t write music, the only way you could submit a song for copyright in those days was, you’d record it. Alex would play guitar and I would sing onto a tape. We found one of these very basic tapes. I just could not remember half of the songs that were there. It was just teenage ramblings. 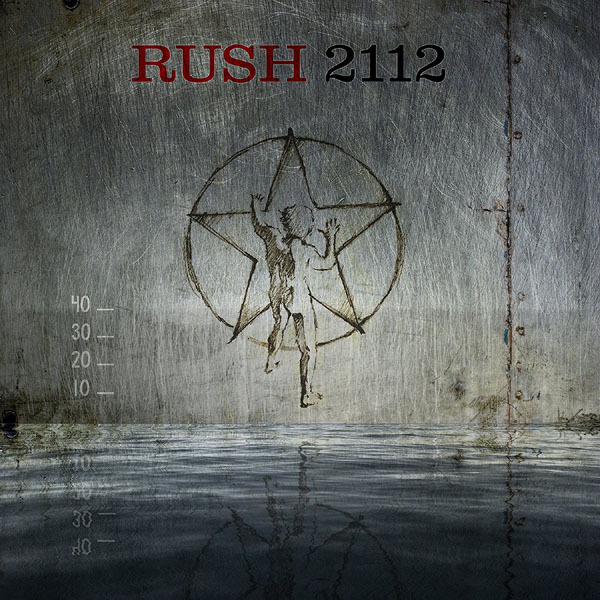 Any chance you’d consider putting out a compilation of previously unreleased pre-1974 Rush recordings? They’re not very musical! Maybe after we’re dead and gone, if somebody uncovers those tapes. While we’re still alive, I don’t think we would want anybody to hear that stuff.